A patio at the home of landscape architect Sean Papich; Built-in stone fireplaces and fire pits are increasingly popular with new backyard landscape projects; decks can help to hide tree roots or sloping lawns. Ah, June. Here in New England, most of us have looked forward to this time of year for months. I know I sure have. Through winter and the dreary, raw spring, I stared out the sliding glass doors in my kitchen and dreamed of the day our dismal-looking backyard would be lush and verdant and my family and I could be outside relishing the landscape. Landscapes are thought out and well designed these days, adds Shea. “Yards are viewed as an extension of the indoor living space.” And the options for outdoor living areas are endless. There are data to back that up: According to the US Census Bureau’s Survey of Construction, in 2014 a majority of new homes — 56 percent — were constructed with a patio while 23 percent of new homes had a deck. Most of the decks Shea and his team build are used as a platform to exit the house and get down to a patio. 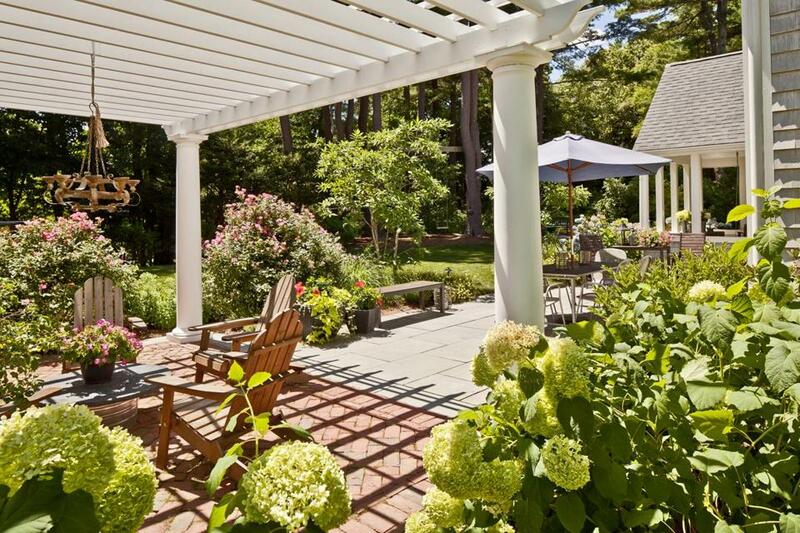 Most patios built in New England are constructed of bluestone, though brick and granite are also used, says Sean Papich, a Hingham-based landscape architect. Generally, the lifespan of a wood deck is about seven or eight years if it’s not cared for, though new lower-maintenance composite decking materials, like Trex, have extended the life of decks. “There are a lot of different color and textural choices out there now--they’ve come a long way,” says Shea. Also, since decks are built above ground, tree roots, wet ground, and sloping lawns — all of which can pose potential challenges for patio installation — can be easily overcome without adding significant expense. Another consideration comes from Jim Finlay, general manager of Archadeck of Suburban Boston: Decks are often considered additions by cities and towns and permits and inspections are necessary to build one. Patios, on the other hand, are exempt from these rules, as they are considered a natural element of your yard. Once homeowners get the foundation of their outdoor havens settled, it’s time to focus on the specifics. 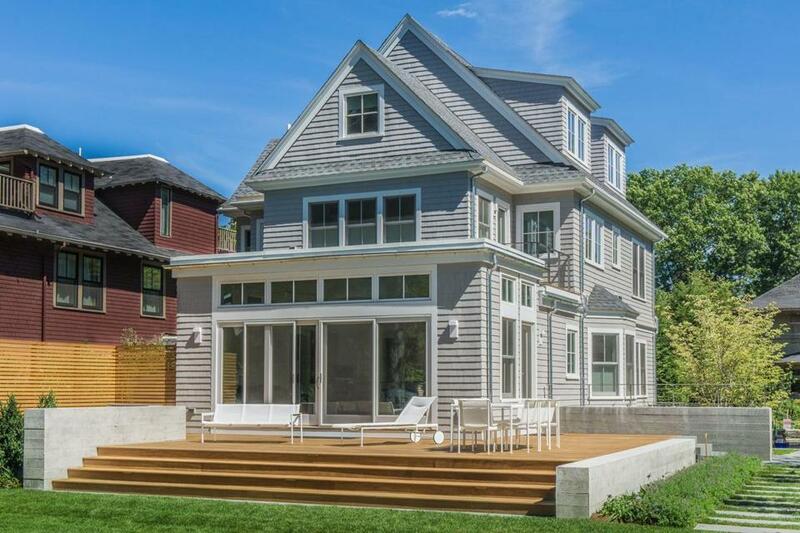 Read on for some of the trends local professionals are seeing. The concept of the outdoor kitchen has evolved considerably. “It used to be that an outdoor kitchen consisted of a built-in grill with an additional burner that may or may not work,” says Papich. Now, in addition to grills and burners, outdoor kitchens feature sinks, smokers, wine coolers, kegerators, and ample refrigerators. People are also including televisions and elaborate sound systems in their backyard havens. Built-in stone fireplaces and fire pits are must-haves in almost every new landscape project Wilhelm is involved in these days. Fireplaces tend to be off to a corner or side of a patio because of the chimney. “Fireplaces tend to be more of an older adult entertaining element,” says Wilhelm. 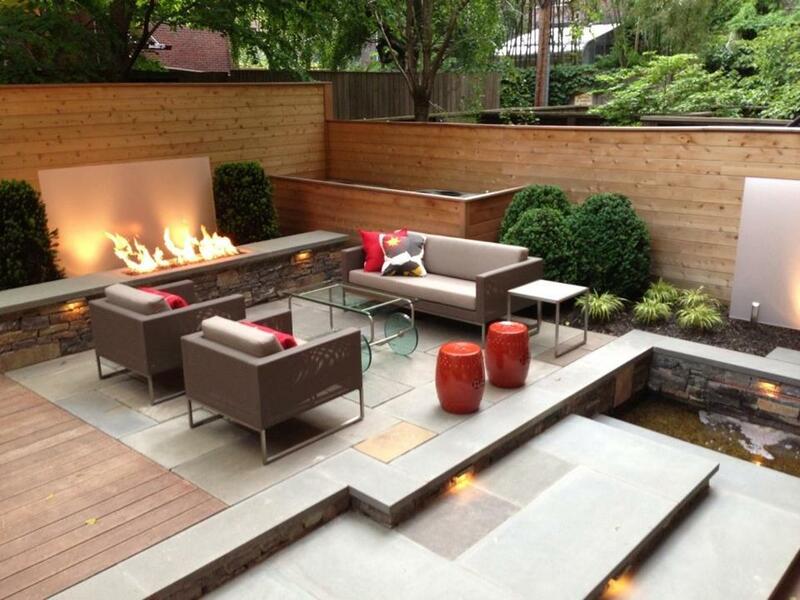 “They just feel more formal.” Fire pits have a more casual appeal. Big glary floodlights are no longer the sole fixtures available for exterior illumination. “Low-voltage outdoor fixtures cast a really lovely glow,’’ says Wilhelm. “At night, a little light can add a wonderful visual piece to a landscape; it sets a mood.” Consider adding down lights to a tree to cast an attractive shadowy pattern onto a patio or up-light trees in the distance so you’re not sitting outside staring into a black void. “It’s also a good idea to add soft lights down a walkway or if you have some sort of a garden sculpture, light it up for some dramatic wow factor in the evening,” says Wilhelm. Decks can help to hide tree roots or sloping lawns. Jaci Conry can be reached at jaci@jaciconry.com.